Every day I was searching for memo that I written in notepad or any other kind of file info that I had on my hard drive, so I created this little application that you can store your memo, .txt, .nfo or info file, that I just need to copy and paste in to it, then when I need themI have them in one easy place in the database and easy to search for.Doesn't use much resources and very easy to use. Live search. * You can enter thousands of entries. * Control for copy all text. Sql Server compact SP2 if not install the program will install it. Qweas is providing links to LuJoSoft NoteOrganizer 2011 as a courtesy, and makes no representations regarding LuJoSoft NoteOrganizer or any other applications or any information related thereto. Any questions, complaints or claims regarding this application LuJoSoft NoteOrganizer 2011 must be directed to the appropriate software vendor. 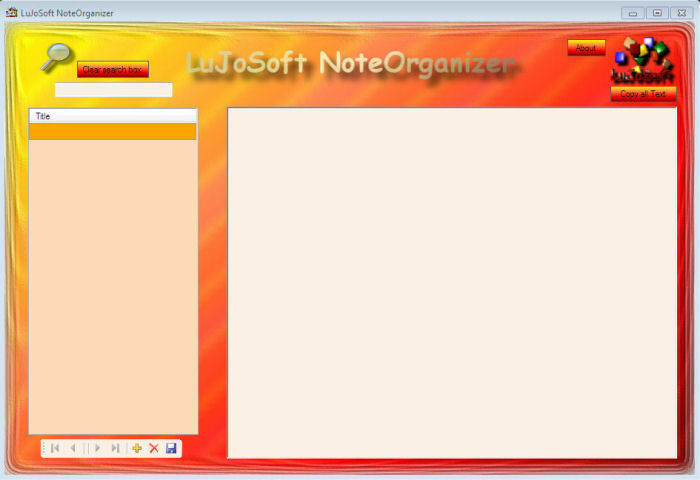 You may click the publisher link of LuJoSoft NoteOrganizer on the top of this page to get more details about the vendor.